I was born and grew up in Jersey City. My childhood was not idylic but definitely different. 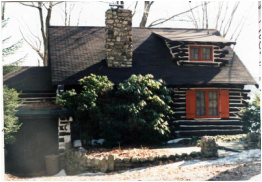 Tall Timbers, a log cabin designed and built by my grandfather, was my sanctuary. It was the place where I escaped the summer city heat with my grandmother and our hunting dogs. During the other months, New York City was a short tube ride away. Here my mind discovered the arts. It was where my imagination first took flight in dance, music, and paintings. Whether my trips in childhood to Europe with all of its museums and grandeur have influenced me, I cannot say. Somewhere within there has always been a lonely child who would visualize stories of animals when rowing a boat or swimming long distances. I drew those childlike pictures for a cousin. Always drawn to learn more about drawing, painting and anatomy, I took art courses throughout my childhood honing the talent which my parents and grandparents chose to ignore and squelch. It was far better for a girl to become a nurse than to be an artist dancing about in the Greenwich Village - and the NYU scene of the 60’s. Finally, with a graduate degree in art history and two young children, my visions materialized. Living and traveling abroad in the midst of great art, stoked my imagination. My predominant pursuit had always been to be a painter of narrative pictures within which there are portraits of both humans and animals. In teaching myself how to paint the faces, satins, fur, seen in the Master Paintings, I injected my own humor by replacing the famous personages with the visages of apes, birds, and domesticated animals. These fantasy works tend to both surprise and haunt the viewer. The small details heighten the sense of preciousness. While the dissonance contradicts the classical paintings’ importance as “high art”, my irreverence becomes evident. Since 2011, I seek peace. No more statements or narratives are presented. The experience of nature is my current driving force. This new direction explores light through color. It is a journey which calls upon everything I've ever learned about technique, composition, color, etc. Abstraction has rejuvenated me. Everyday is a new journey. Change one thing and the whole work has to be rethought and reworked. I am finally painting for myself! Note: I always felt that my maiden name Zjawin, which means a "seer of apparitions" in Polish, suited me. Guess I grew into my name!